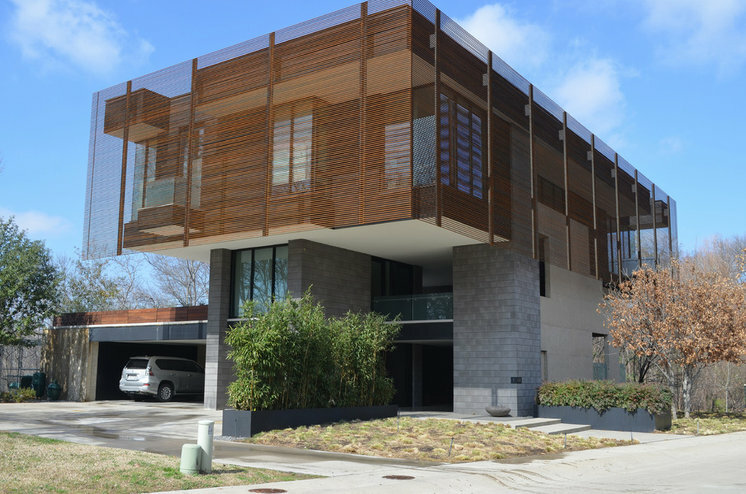 With their modern Dallas home, Diane and Chuck Cheatham want to show that you can build big and still make ecologically sound design choices. Their house serves as the gateway to Urban Reserve, a neighborhood built with green living in mind. 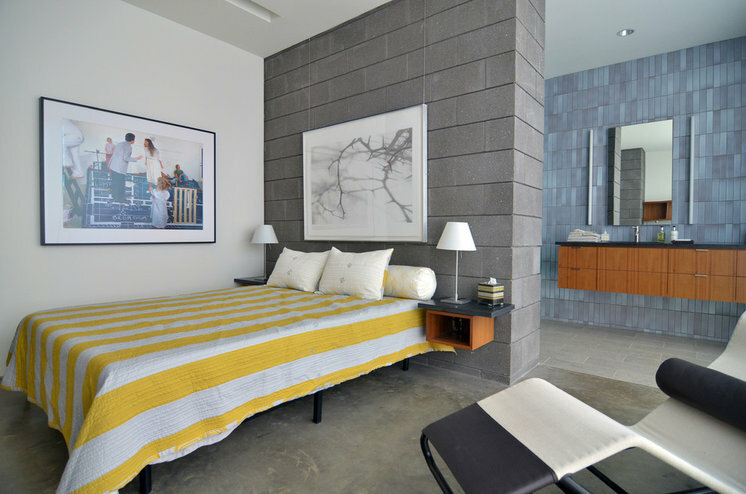 Diane, the chief executive of Urban Edge Developers, developed the 50-home enclave. 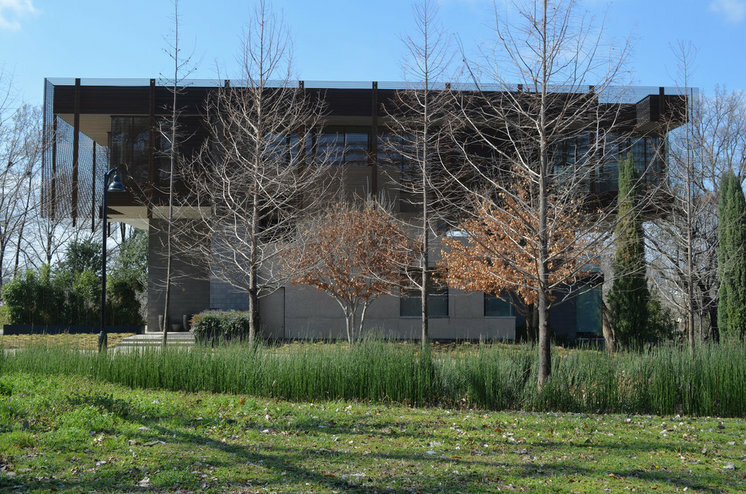 Her goal was to create a development that brings together modern design, access to nature, respect for the environment and a beautiful location close to downtown Dallas. 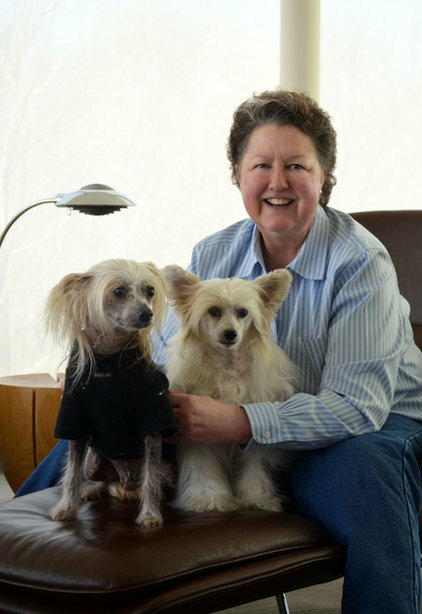 Who lives here: Chuck and Diane Cheatham and their Chinese Crested dogs, Wizard and Ruby. They raise chickens and have a koi pond too. The house is organized vertically, with the main living space on the top floor. 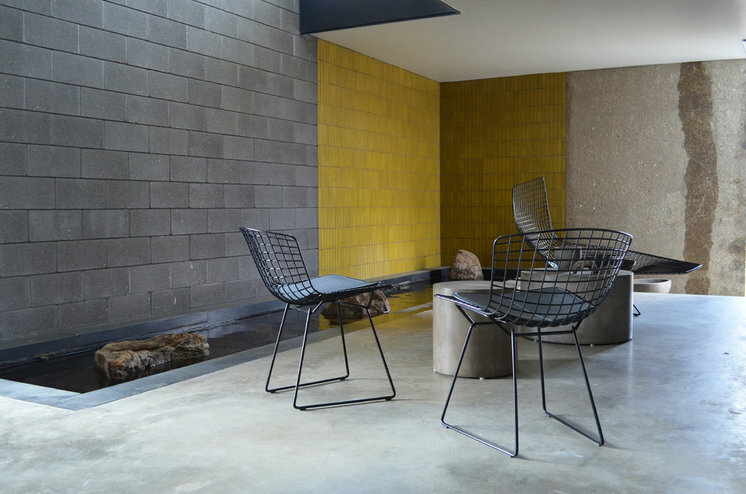 The first floor includes a self-contained apartment with two bedrooms, two bathrooms and a living room as well as a garage, art storage and a wine cellar. 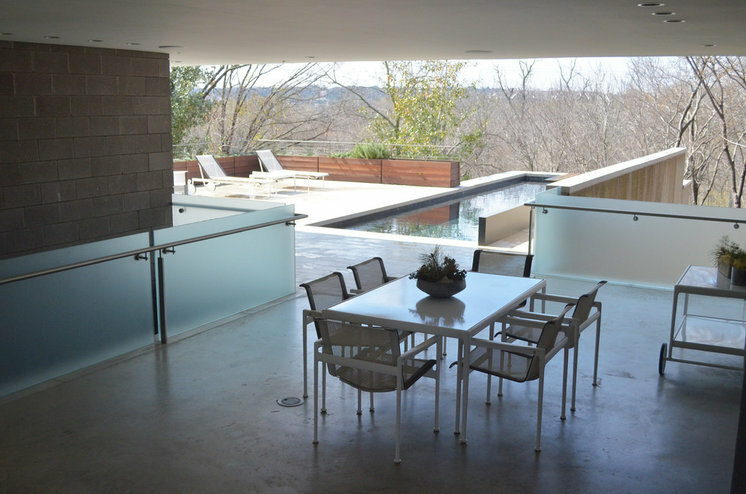 The second level provides outdoor living space, which includes an outdoor kitchen, terrace and pool. This second floor connects the first and third floors as communal areas for socializing, rest and relaxation. 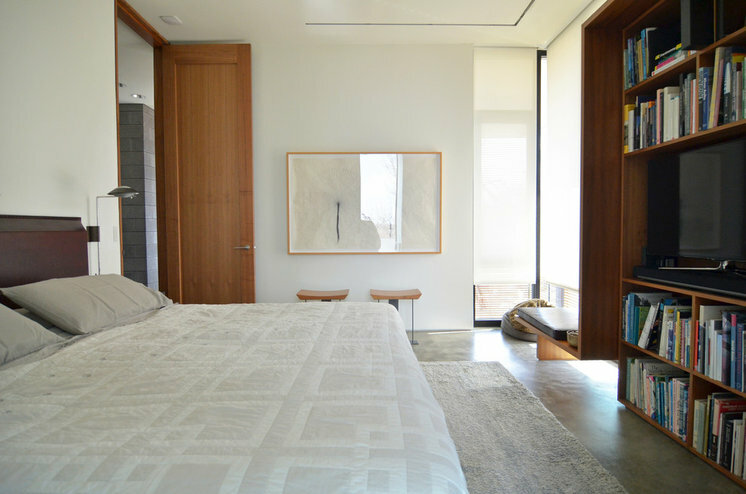 The third floor is the couple’s main living space, wrapped on two sides by a raw steel screen that provides shade from the Texas sun and privacy from the street. This floor includes one bedroom with an en suiteand a walk-in closet, powder room, laundry, den, kitchen, dining room, gallery and living room. 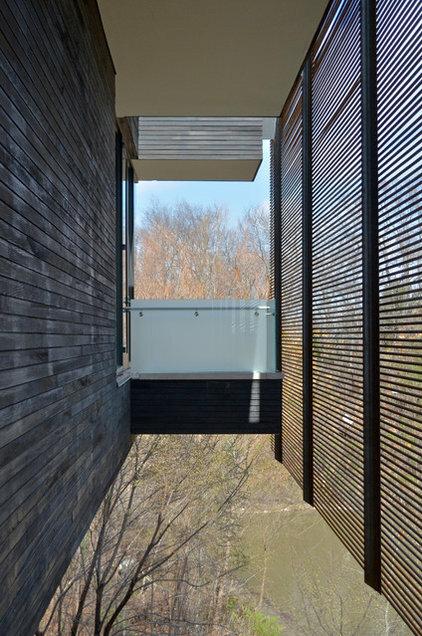 The third floor also has two exterior overlooks that allow a step outside to view the landscape, ponds and sky. The prospect of creating high-design green homes attracted local architects. “We have seven architects on this street that have bought lots and built their own houses. I doubt there is another street on the planet with seven architects living there,” says Diane. 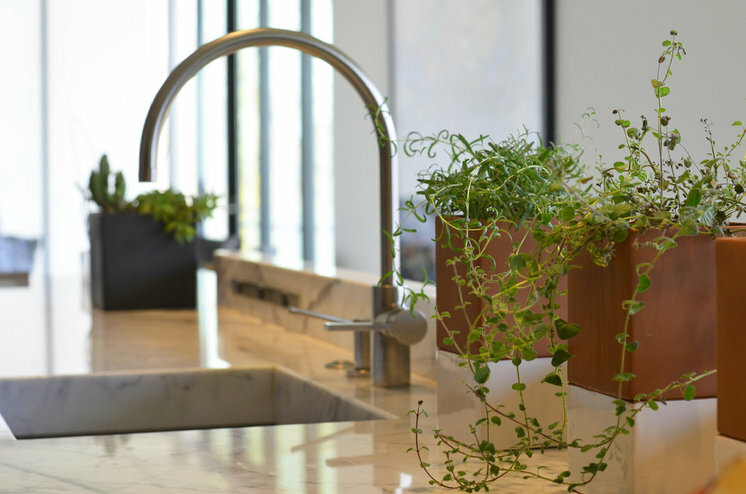 Water conservation is a cornerstone of Diane’s concept for Urban Reserve. The landscape is designed to operate as an environmental filter. Catchment waters above the site are allowed to flow into the development, where they merge with the onsite flow. Grading directs the water into rain gardens, which line the street edge and are separated by pockets of head-in parking. Toxins washed from the paving are filtered by percolation in a process that situates the solution next to a source of the pollution — the car. After being processed by the rain gardens, the improved water is conveyed into ponds, where wetland plants further improve the water quality, before it is returned to the plantings via subsurface irrigation. The entrance to the main living space is a short elevator ride to the top floor (there are also stairs). 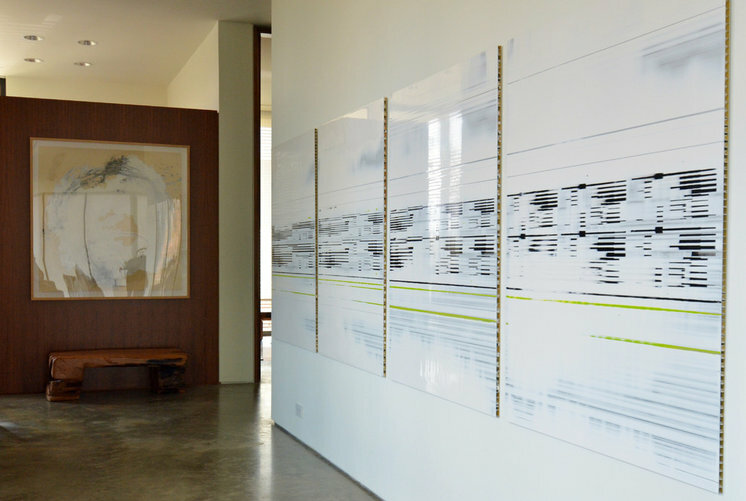 The foyer features a bright space to showcase the work of American artist John Pomara. The quartet of paintings is called “Arrested Development #1, 2, 3 and 4.” The art featured at the far end of the foyer is by Joseph Havel. Diane adores hosting dinner parties and makes very good use of the modern dining room. The couple tapped interior designer Joshua Rice to help them find furniture for the house. 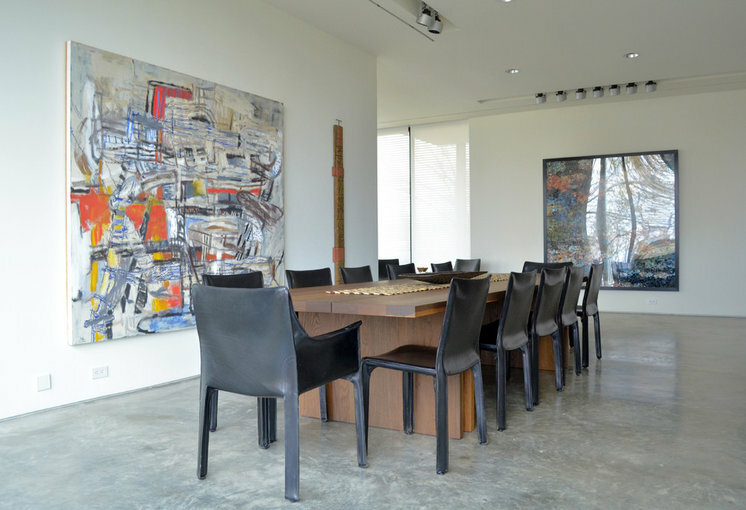 The biggest splurge piece was this dining room table for 12 crafted by The Matin Gallery in Los Angeles, disassembled and reconstructed in Dallas. 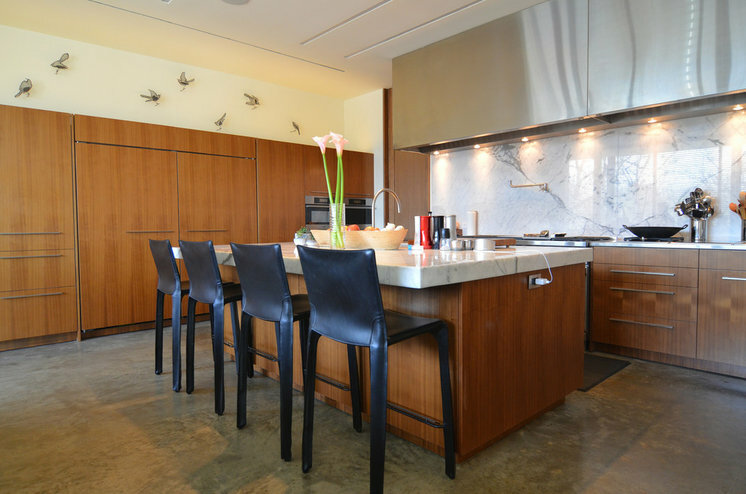 The kitchen, dining and living spaces flow from one to the other in a sweeping open-concept layout. 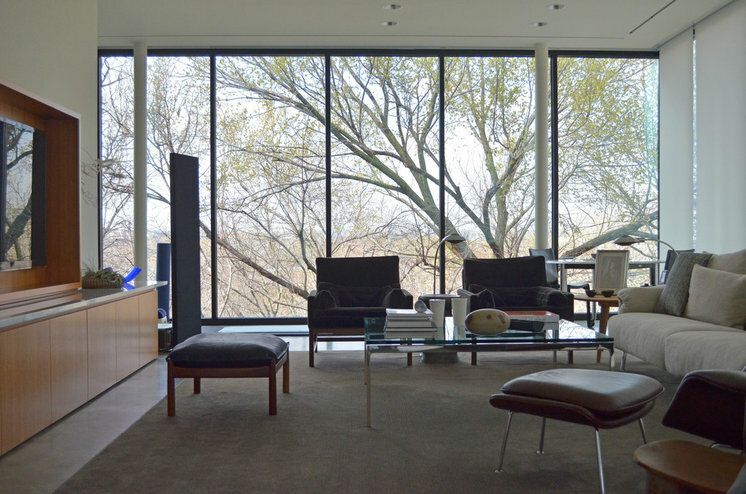 Floor-to-ceiling windows bring in maximum natural light, which means that the couple rarely turns on lights during the day. 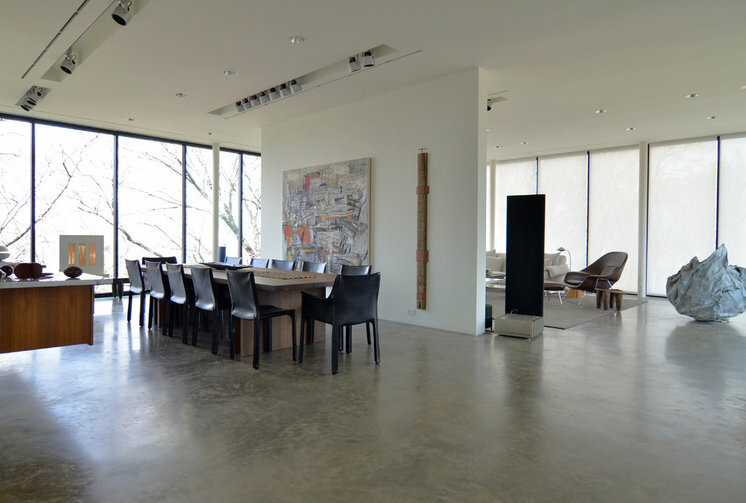 Continuous concrete floors unite the rooms. The house features geothermal heating and cooling, high-performance windows, spray-foam insulation and an 18,000-gallon cistern that collects rain runoff from the roof. The geothermal heating and cooling system uses 250-foot wells in lieu of compressors, and the unit inside the house is a heat pump. Geothermal systems use much less energy than conventional split systems. 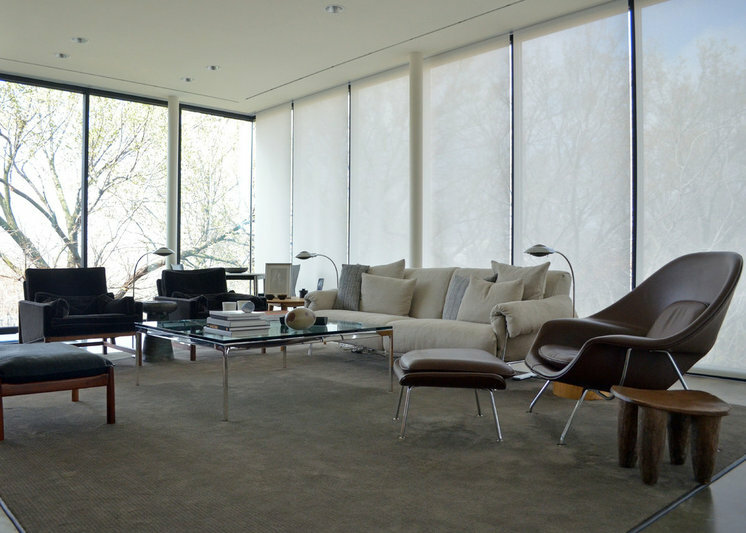 Mechanized window treatments throughout the house are set on timers that are synced with the location of the sun, an important feature given the summer temperatures in Dallas. When making design decisions, the Cheathams look for high-quality furniture that is both comfortable and stylish. The modern furniture, much of it sourced from Cantoni, is upholstered in neutral tones so as not to detract from the treetop views. Diane says that her proudest homeowner moments come when she’s hosting guests. This month their home will be featured in the 10th annual White Rock Home Tour. “I love to cook and entertain, so the third floor was designed for these two activities,” says Diane. The kitchen is about 1,000 square feet and includes a central island plus an extra counter and sink area so visitors can assist in prep, cooking and cleanup. 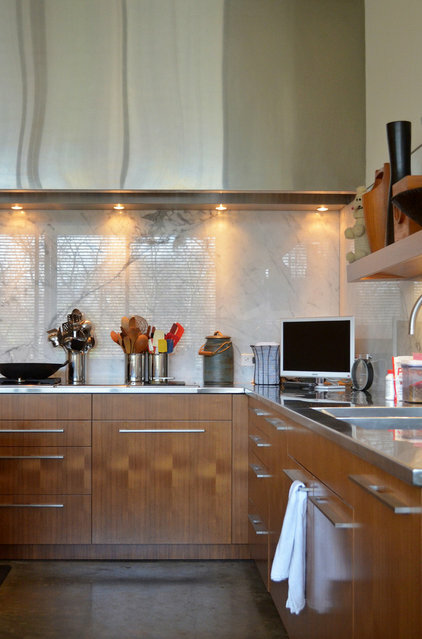 Stainless steel hoods sit over the main cooking area, while gray-veined marble slabs comprise most of the other surfaces, including the backsplash and the island top. The sleek cabinets are walnut. 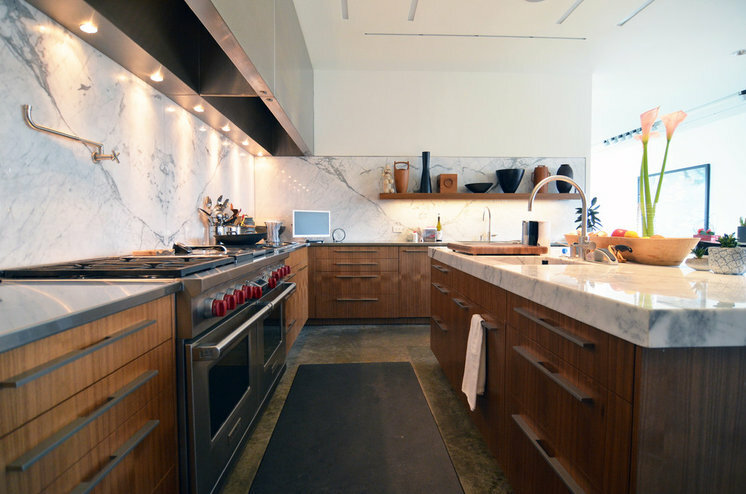 The kitchen has a 20- by 10-foot pantry for the couple’s cooking paraphernalia. Diane enjoys growing fresh herbs in the kitchen for cooking. A small sink, set into the “guest” counter, allows for an all-hands-on-deck style of entertaining and cleanup. 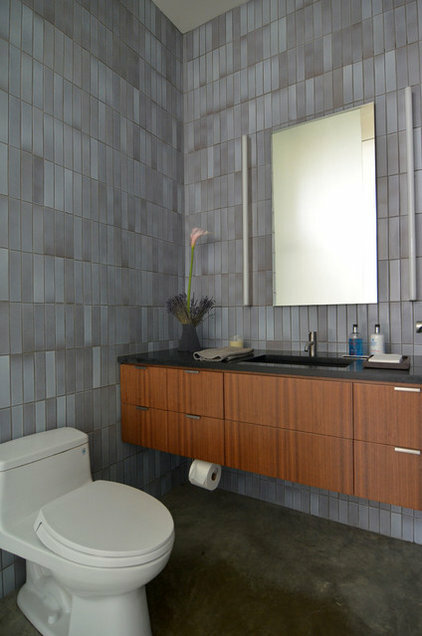 A floating walnut vanity in the powder room is set off by vertically installed floor-to-ceiling Heath Ceramics tile. 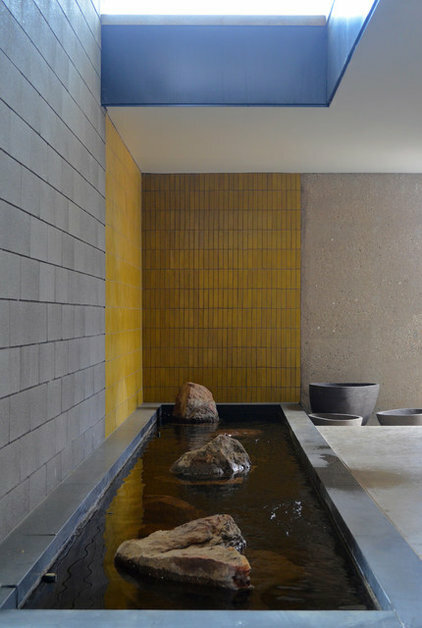 Heath tile is used in all four of the home’s bathrooms as well as on the outdoor accent wall behind the koi pond. The most surprising thing about the couple’s home is the low-chlorine swimming pool on the second level. “It really gives a different perspective when your view is treetops,” says Diane. 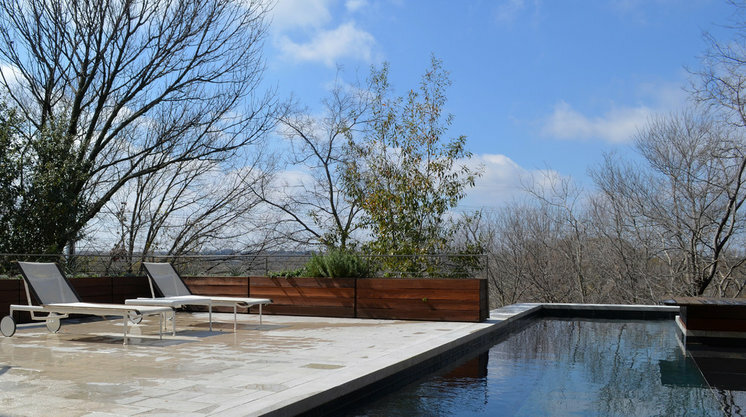 The pool rests atop the 18,000-gallon cistern that stores rainwater and runoff. A raised garden bed filled with cooking herbs marks the edge of the deck area. A shady alcove just outside the guest quarters contains a koi pond lit by an overhead skylight. This enclosed outdoor space provides protection from the elements and keeps the patio naturally cool due to shade and airflow. The wooded ravine behind the couple’s house is also a throughway for Dallas Area Rapid Transit. Public transportation is readily available to residents in Urban Reserve. Every 10 minutes or so, a yellow train quietly whizzes by the property. The couple has laying hens on the back side of their home. 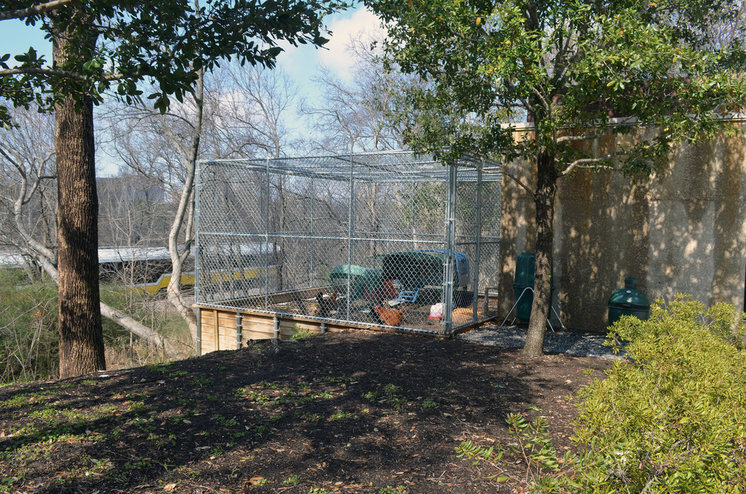 The coop is contained by a chain link fence that gives “the ladies” a great view of the green space below. Ruby and Wizard, Diane’s two Chinese Cresteds, join her in the living room for a cuddle.